Yes, the figure of speech is to “bell the cat,” but this bell, while having a pretty dainty tinkle, is made for hanging from a dog’s collar so you can track the pooch in the field. 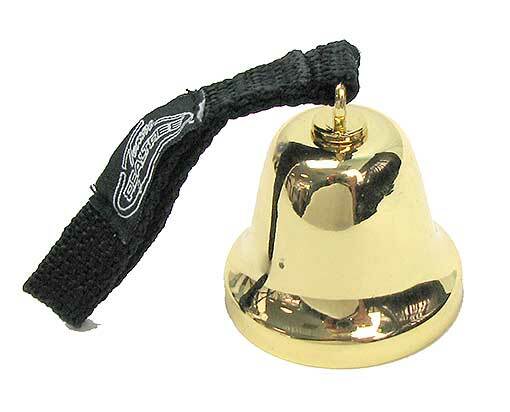 Brass-plated (the bell, not the dog), it measures 1-3/4” x 1-3/8”, and hangs on a 3” long canvas strap. No dog? 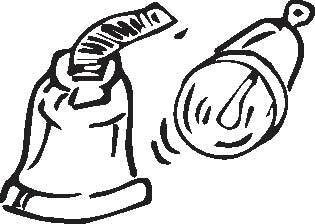 Use it to call your footman. Dogs just wanna have fun. You can help by getting yours this 3” dia thick flashing rubber ball toy. (It’s a great present for Rin Tin Tin’s birthday, September 10, which most dogs celebrate.) 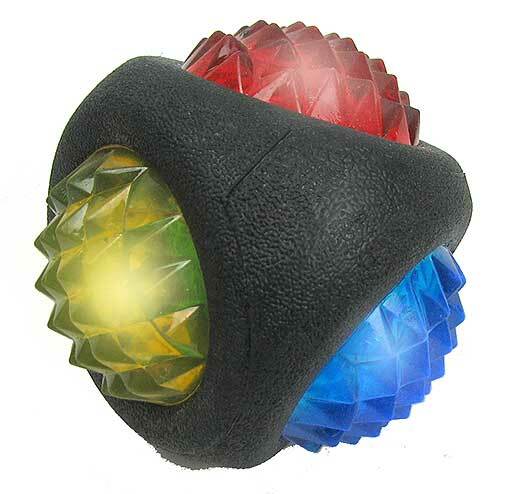 In black rubber with 1-3/4” dia insets of translucent red, yellow, green and blue rubber spikes (good for their teeth) with flashing LEDs behind them, activated by bouncing. Excellent for nighttime fetching. This idea is for the birds. Literally. A green/black plastic perch, dish, and dispenser that you can screw onto an inverted plastic pop bottle to convert it into a bird feeder. 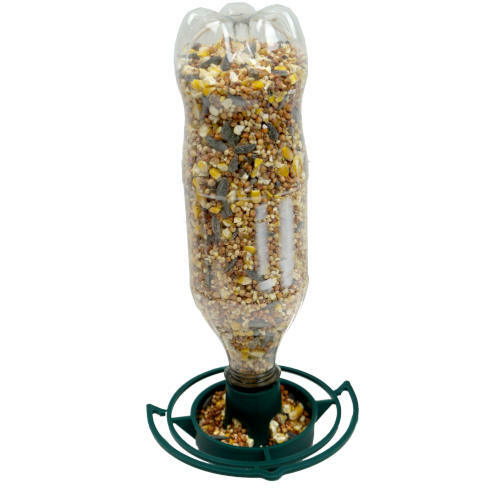 Obviously, the bottle should have been emptied of pop and filled with seed. One of those "100 things to do with old coat hangers" ideas that really works!! Complete with instructions and bail to hang the completed feeder. Please note: this feeder will not attach properly to the new Coca-Cola low-profile bottles. 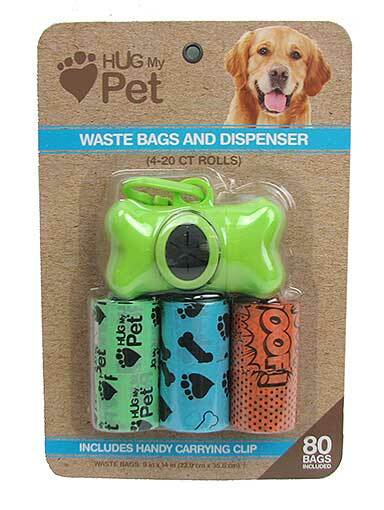 For your dog. 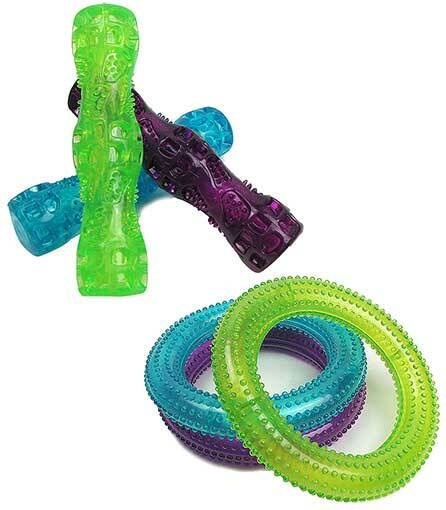 These thick rubber chew toys will take some serious mastication. 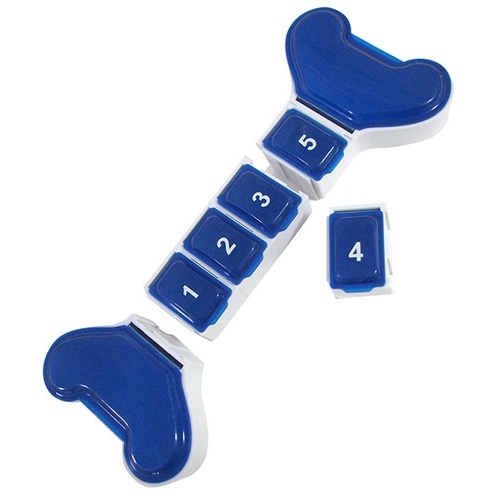 You pick: the faux bone has a squeaker inside, is covered with indentations and nodules for for added chew-fun, and measures 6-3/4" long x 1-5/8" dia; or the chewy rubber ring, 7" dia x 4-7/8" ID x 1-1/8" thick. We’ll pick one in either purple, green or blue because dogs don’t care and neither should you. 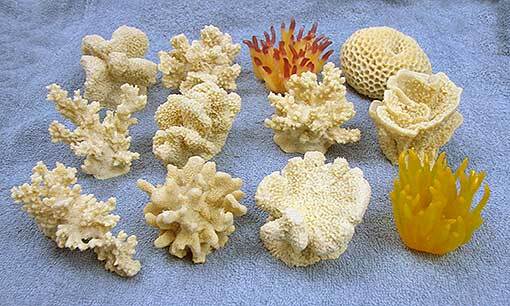 Made for use in aquaria everywhere, these dozen polyresin reproductions of coral and sea anemone are nifty in their own right, and a stylish person might put them on a desk, dresser or mantel. They measure between 2-1/4" and 3-1/2", and include cat’s paw, velvet stone, cauliflower, branch and brain coral, and Atlantic anemones. In an ivory color for the most part, but paintable if you like authenticity, although we’d skip the aquarium use unless you use aquarium approved paints. We’ll pick (2) different, or you can get the whole undersea 12 pack assortment. A steal at twice the price! It's a petzapalooza. 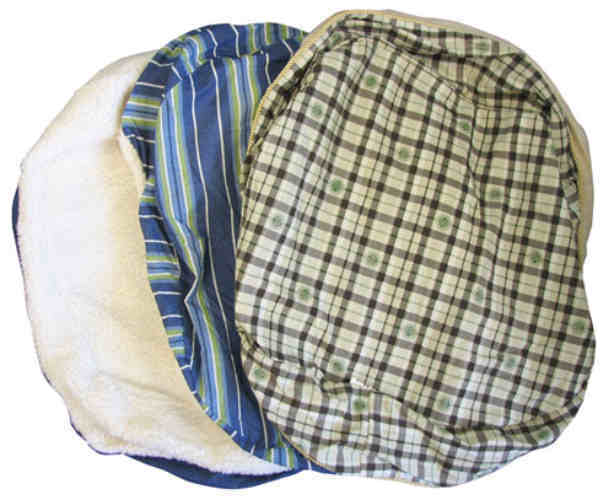 We'll dig into our enormous stock of pet home furnishings and send you (3) unfilled pet beds in (3) different sizes, small, medium & large, ranging from a cat/yorkie size 12" x 12" up to a Marmaduke-ish 37" x 42". Some may be faux sheepskin (no faux sheep were harmed, etc.) or vinyl or even actual leather and some will have a zipper, some an opening suitable for sewing shut. All you need to do is stuff them with some stuff and put some pets on them--or find some other use for them, you clever dog, you. 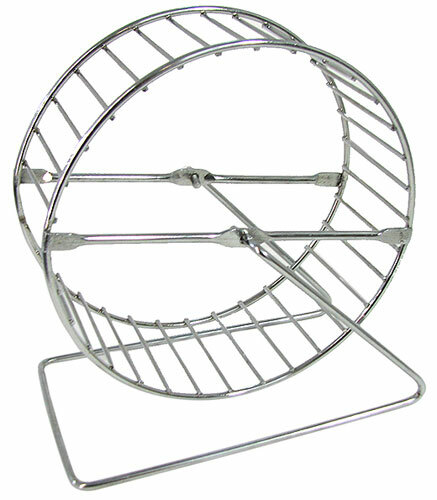 Hamster wheel. In steel, 4-7/8” dia x 2” on a 5” x 3” wire base. Also capable of amusing adults who spin it on top of their desk and squeeze it to make it stop over and over again when they can’t quite make themselves do any actual work. Sorry, hamster not included. At over 9” long, these pill boxes have either (7) sections marked with the days of the week (SMTWTFS) or (5) sections marked 12345--and they’re shaped like dog bones, which is fun. As a bonus, all have (2) extra compartments at the bone ends so you’ll get (7) or (9) sections, depending on which ones we pick for you. They’re also randomly colored red or blue--another exciting choice we’ll make for you. All dogs sleep better on fake sheep. 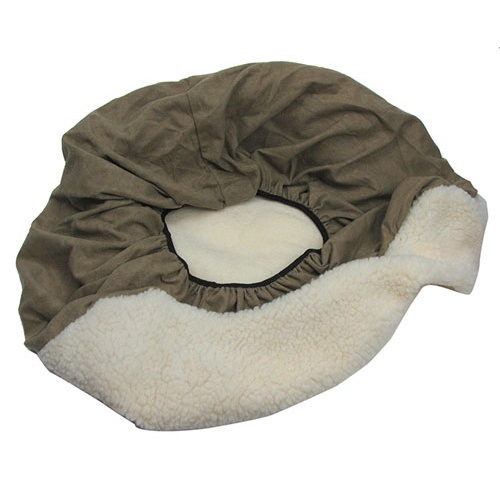 Ths fleece and nylon circular pet-bed cover measures approx 19” dia with additional 7” deep fleece sides and a stretchy elastic bottom to fit over a round pet bed. No pooch? Slide it over a round ottoman to keep your feets cozy on chilly nights. Don’t let your dog go out again with a mismatched collar and leash set. You may think your pooch doesn’t care, but have you noticed the disdainful looks on the other dogs’ faces? What kind of a person are you? You pick: the small-dog set, a 5/8" wide nylon collar adjustable from 9" to 14" with a 5/8" D-ring and molle buckle, and the matching 5/8" wide, 6-foot leash with a swivel-snap hook; or the medium-dog set, a 3/4" wide nylon collar adjustable from 14" to 20" with a 3/4" D-ring and molle buckle, and the matching 3/4" wide, 6-foot leash with a swivel-snap hook. 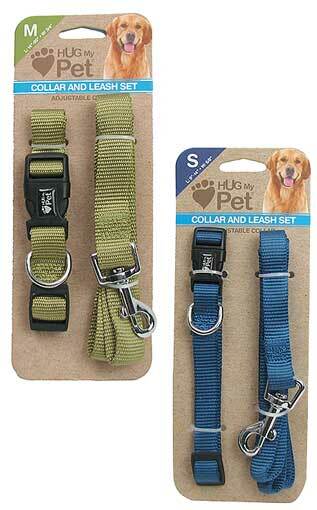 We’ll pick a set in blue, gray, green or red that will either complement or smartly contrast with your dog’s coat.